As easy as it is to forget that the iPad isn’t just a little Angry-Birds-and-Netflix machine, it’s always nice to see someone building something meant to teach kids a thing or two. Exhibit A: Motuto. Launched this morning, Motuto takes live tutors from around the world and shoves ’em into the iPhone, iPad, and, before too long, Android devices. Once the free app is installed, users pick from a range of subjects for which Motuto has tutors on standby, covering much of Grade 7-12 math and sciences. They’re connected to the tutor as soon as one is available (if there’s a wait, the user is alerted via push message when their time comes), at which point their 20 minute tutoring session begins. 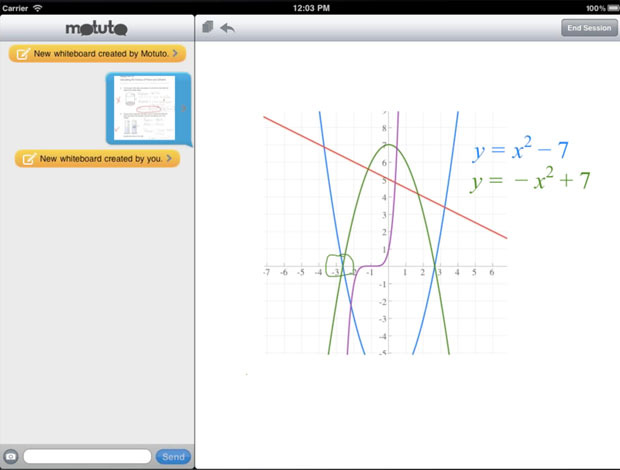 Tutor and student communicate via text chat (students can also snap and send photos of their problems), while a real-time, two-way whiteboard runs alongside for demonstrations. Sessions are stored on the device for later studying, and can be e-mailed to the student for printing and sharing. Each new user gets 1 free 20 minute session, after which point each session will cost around 5 bucks a pop. Motuto’s developer, Castle Rock Research, pins this pricing model as their strength; real-world tutors generally don’t come cheap, while their virtual competition (such as Tutor.com) tends to charge monthly fees rather than per session. It’ll be interesting to see how that pricing model plays out. As pretty much every US wireless carrier has learned, a huge chunk of the populace seems to prefer to pay more for “unlimited” access rather than pay less for limited portions – even if they don’t really need unlimited access. Castle Rock tells us they plan to up the value of their product in the near term with topic-relevant study guides, built to help ensure that any lessons learned are properly nailed in. Also coming soon (“in a matter of weeks”, they say): Android support. What do you think? Is mobile tutoring the instructional aid of the future? In a world where every second App Store review complains that 99 cents is too much, will $5 pay-per-sessions take off?